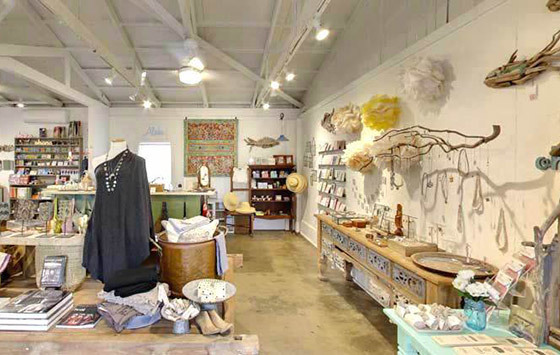 The Royal Coconut Coast offers some of the best retail therapy on Kauai. 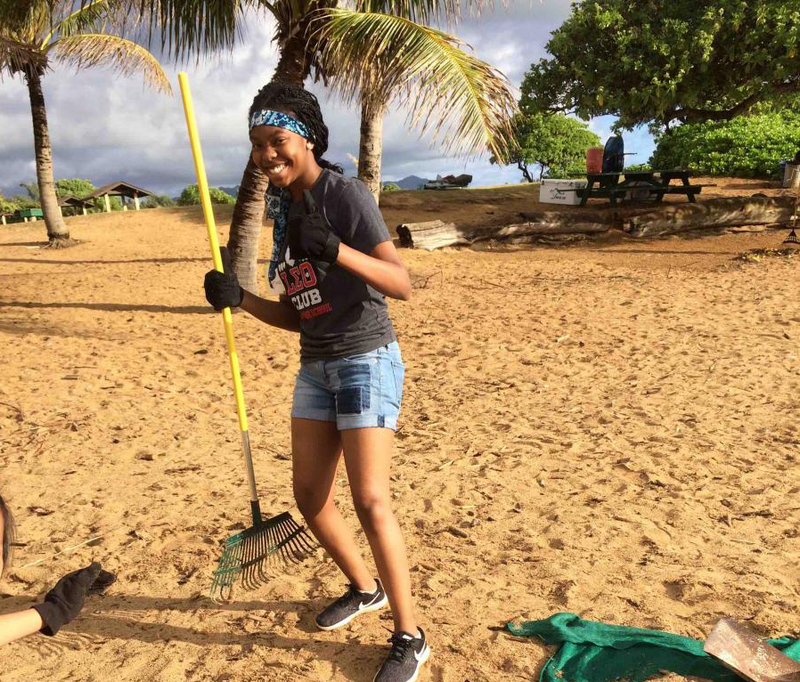 You can walk around Old Kapa‘a Town, frequent several shopping centers, galleries, craft fairs, and farmers markets for all your shopping needs. Explore and find gifts for everyone on your list. Local shops offer souvenirs, aloha wear, shells, leis, local art products, and other goods to take home to your loved ones. You can even send them a coconut postcard! There is a wonderful craft fair that gives you the chance to interact with vendors and purchase unique hand-made local crafts and gifts, jewelry, clothing, quilts, and art. There are also farmers markets every week, a great place to try fresh local fruits and veggies, drink a cold coconut, or pick up some locally made jams, jellies, or honey to take home. In addition, all the necessary conveniences are nearby including grocery stores and coffee shops. Plan on attending the Old Kapaa Town First Saturday Art Walk, an event filled with music, food and lots of great galleries with custom arts and crafts. Extra parking for this highly popular event is at the Restore Kauai property, 4451 Lehua St., (next to Specialty Lumber). Sonflower Florist & Gifts is a full service florist specializing in unique personable designs that speaks in its own artistic flavor. From weddings to arrangements and centerpieces to a simple birthday lei, Sonflower Florist & Gifts is ready to create something beautiful for you. 4597 Olohena Road, Kapaa, HI 96746, Located near the roundabout across the street from Mayor Baptist Sports Complex. Meander through 2,000 square feet of exotic blooming orchids, ending with fun shopping in our Kauai products gift shop and orchid art gallery. 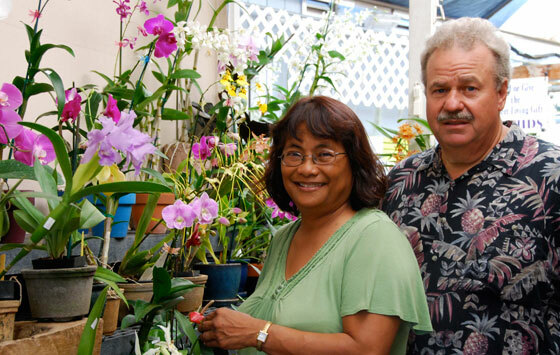 Orchid Alley offers stunning & shippable orchid gift baskets, species, and hybrids, (many created at Orchid Alley by owners Neill and Fely Sams). Orchid Alley ships via 2 day air, or provides easy airplane carry-on packing services. 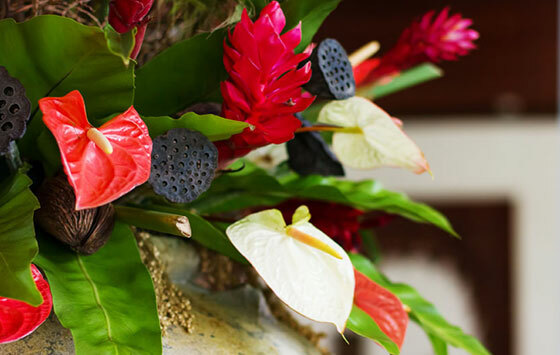 Family owned and operated since 1996 JC’s is the place to go for extraordinary flowers specializing in tropical flower arrangements, Lei, and Haku. 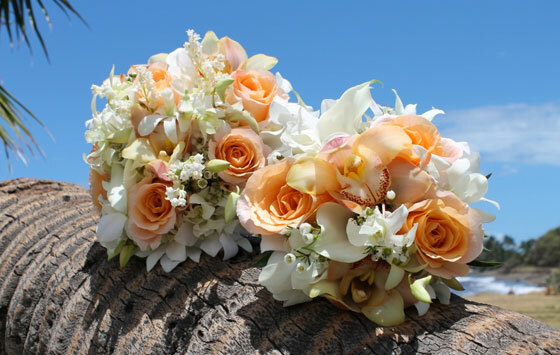 Commemorate the special moments in your life with beautiful one-of-a-kind arrangements and gifts prepared with Aloha. Offering delivery services 7 days a week throughout the island and shipping to the US Mainland and Canada. Everything from Weddings and Special Celebrations to Sympathy, Balloons, or personalized gift baskets the team at JC’s Flowers and Mini Mart is ready to help you. In the heart of Kapa’a town, just off the main highway you will find this great one stop shop for all that is Photos and Photography. Our Camera Shop offers a wide variety of camera and photography supplies from batteries, to tripods, to special lenses, polarizers, cases and more! DSLR Camera rentals (w-Polorized) and a variety of cameras and lenses are also available for rent during your stay or for the day. 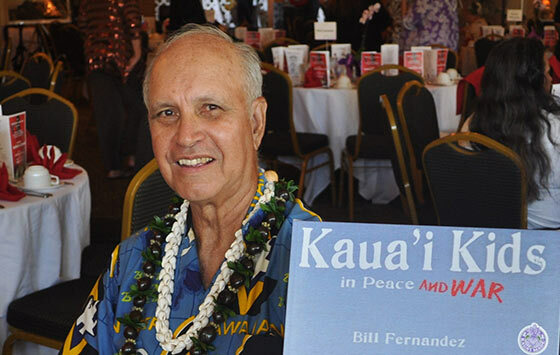 Bill's memoirs about the Coconut Coast/Kapa'a area are popular gifts. His barefoot adventures in the ocean, plus vivid descriptions of the WW Two era when he shined GI shoes and carried a gas mask are unique glimpses into local lifestyle. His historic novels focus on Hawaiian struggles with Westernization. Available at the museum, Kaua'i Store, Hanapepe Bookstore, and Amazon. Located in historic downtown Kapa'a for over 30 years. 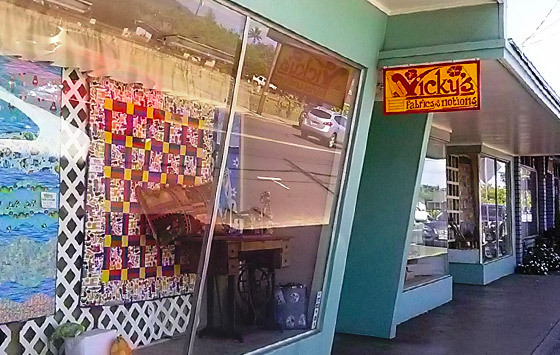 Family owned and operated Vicky’s is a one stop shop for Hawaiian Fabrics, Notions, Patterns, Quilting Kits, Special and Unique Gifts, and so much MORE! 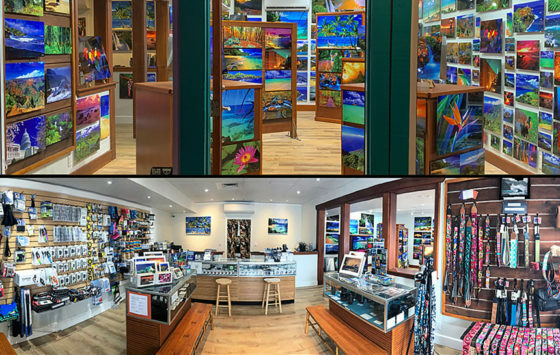 You will be glad that you stopped in to experience the friendly, helpful, and knowledgeable staff to make your search for that special creation a gift of Aloha. 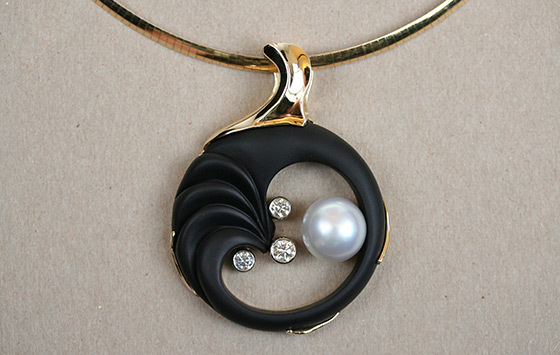 Jim Saylor Jewelers has been passionately serving Kauai locals and visitors since 1976. A truly fine jewelry store with a great selection of pearls, fine gems and diamonds. 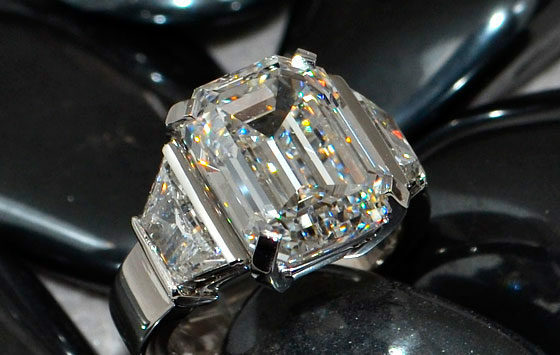 The staff at Jim Saylor Jewelers create special custom pieces in their on site studio. Curious… is located off the junction of Kuhio Hwy. & Olohena Road, in Kapa‘a town next to Orchid Alley in the Heart of Kapa‘a Town. Curious… appeals to locals & visitors alike. Owned and managed by Andrew Gawdun & Bryce Toney, the store is open Tuesday - Sunday, 10 a.m. until 6 p.m. 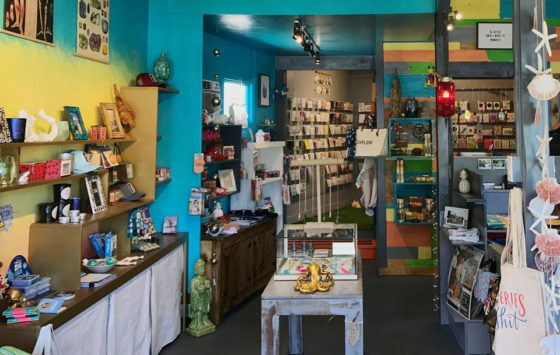 They are a fun unique novelty gift and home accessory shop providing a range of hand-crafted items, handmade furniture, and a unique and expansive gift card collection. Stop in soon, you will leave with a smile! As often as possible, KIKO honors the handmade over the mass-produced, simple over glitzy, useful over useless, wood over plastic, fair trade over exploited, unique over you’ve-seen-it-everywhere-in-the-tourist-shops. We want to become a community gathering spot, a place where people feel welcome to just hang out in our alley, or attend a workshop, shop for a gift, or just visit. A place where people will feel that we’ve tried hard to make them happy. We are located in the heart of Kapa'a Town near Vicki's Fabrics and "tucked away" next to Jim Saylor Jewelers. Open Daily from 10AM - 6PM. 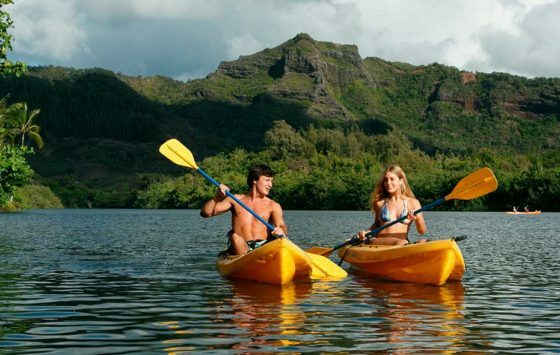 If you can’t come to Kaua'i anytime soon, we hope you’ll hang out with us online. Are you ready for the ultimate hands-on chocolate making experience ? 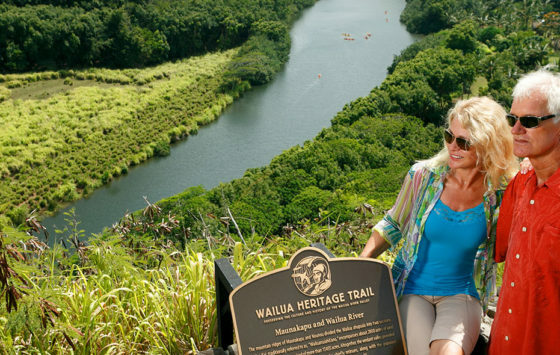 Wild Kauai Chocolate offers chocolate making classes, chocolate school, and daily tastings of delicious handcrafted been to bar chocolate and sumptuous chocolate tea. 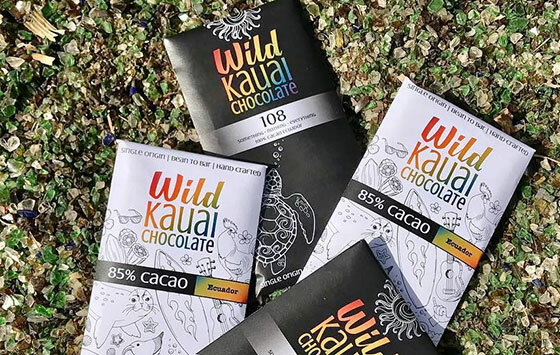 Visit us Tuesdays through Fridays from twelve to five p.m. to taste and buy our chocolate products, or book your morning Build-a-Bar workshop or chocolate making experience online at www.wildkauaichocolate.com.